Taliban militants have shot and killed the senior judge on a provincial appeals court during an ambush in Afghanistan’s eastern province of Wardak. Afghan officials said on Sunday that Mohammad Anwar, a judge in the neighboring Ghazni Province, was gunned down the day before. 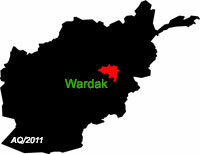 The Taliban claimed responsibility for the attack. The militants have stepped up their attacks on security forces and officials over the past several months. Afghanistan is gripped by insecurity more than 14 years after the United States and its allies attacked the country as part of Washington’s so-called war on terror. Although the 2001 attack overthrew the Taliban, many areas across Afghanistan still face violence and insecurity. The militant group recently refused to participate in peace talks with the Afghan government until its preconditions are fulfilled. Over the past months, Taliban militants have captured some key areas in the north and south of Afghanistan. The militants have also carried out attacks in the capital, Kabul. This has prompted renewed efforts in the country and by neighbors to revive stalled negotiations between the militant group and the Afghan government.